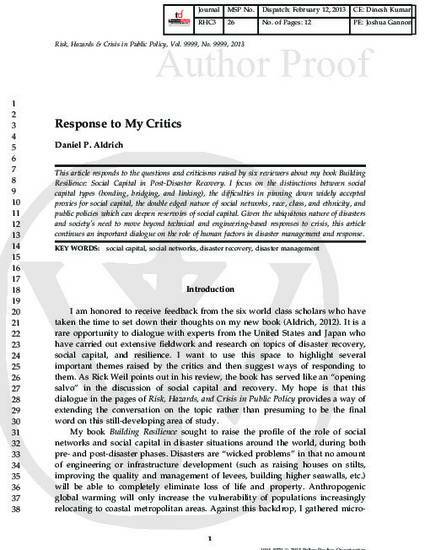 This article responds to the questions and criticisms raised by six reviewers about my book Building Resilience: Social Capital in Post-Disaster Recovery. I focus on the distinctions between social capital types (bonding, bridging, and linking), the difficulties in pinning down widely accepted proxies for social capital, the double edged nature of social networks, race, class, and ethnicity, and public policies which can deepen reservoirs of social capital. Given the ubiquitous nature of disasters and society’s need to move beyond technical and engineering-based responses to crisis, this article continues an important dialogue on the role of human factors in disaster management and response.